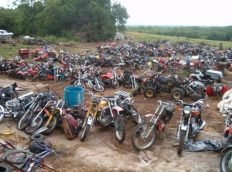 Motorcycle Salvage Yard is where you will find used Motorcycle parts salvaged from old and nearly new Motorcycles. If your looking for cheap or cheaper parts for your favorite Motorcycle then you may want to start looking at a Motorcycle Salvage Yard and get some pricing before buying new. Why would you pay full price when you can pay almost half or less by using reclaimed Motorcycle parts. You can find things like batteries, brakes, engine parts, body pieces, gas tanks, frames and even protective gear and usually half the price of a new and normally these reclaimed parts are in excellent shape with maybe only minor surface marks, scratches or bruises. Sometimes many of these reclaimed parts are perfect in every way. One very large supplier of reclaimed parts is Motorcycle Salvage Yard and they are located in Toronto Ontario. These guys have an incredible amount of parts that you will save money using.